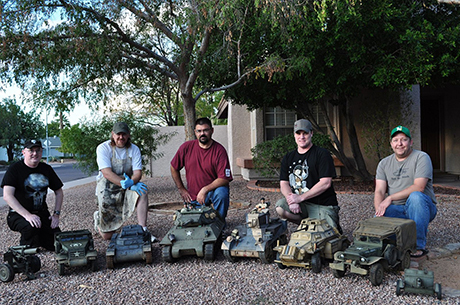 The AZ Joe Heads started meeting back in 2000 in order to show off our 1/6 scale collections to a group of likeminded collectors. Most of the group has aliases that translate to board names on the various hobby message boards. Our founding members were Jeff (Geppetojoe), Aaron (Redleg007), Doug, Brian (Graeylin), Burke (Talon65) and Tom (Mordred). Current, active members now are Jeff, Aaron, Tom and Alex. We welcome new members, just e-mail us with your interest and we'll let you know when we're meeting next. We do not have any club dues. Meetings usually occur at one of the member's houses, but we do sometimes meet at central locations for outdoor group dioramas and at local shows. We meet to show off our vehicles and figure collections and to talk about the hobby. From 2002-2008, the group put together dioramas to present at 1/6 collector conventions in California. Dubbed the Weekend of Heroes, our group did dioramas depicting the Battle of Stalingrad (WWII), the Battle for Berlin (WWII), The Battle of Kharkov (WWII), and a WWI trench diorama. We have also done local dioramas for the Southwest Military Transport Show. Questions? Comments? Interested in joining us? Check out our Facebook Page for the latest updates, news and events.